We had every intention to depart Port Angeles with the early flood tide on Saturday, July 1. At the 4am alarm, we were barely conscious of thinking awwww, we’re so sleepy…just a few more hours. We left five hours later, give or take, and that was the day we learned to truly respect the tides and currents. Our transit to San Juan Island–across the Strait of Juan de Fuca, northward along the Canadian border and up Haro Strait into Westcott Bay–took 10 hours, more than double what it should have, as we clawed our way ALL DAY against a speedy head current. The boat made five to six knots over the water, which translated to a measly two to three knots over the ground against that pesky current. After that day, we really paid attention to our tide and current tables. Westcott Bay, San Juan Island. This place certainly vied for a top spot among our San Juan anchorages, but it’s impossible to name a favorite. Every corner we round brings a host of new experiences and every place wins for different reasons. On our arrival at the beginning of the holiday weekend, Westcott Bay and its neighboring Garrison Bay teemed with boats of all shapes and sizes. Giant motor yachts rafted with smaller yachts, sailboats and trawlers. Just a taste of the rafting craziness!!! We counted as many as a dozen tied together in a row, each boat with its own dinghy tender floating behind it. Some had extras: tethered kayaks and canoes and floating tubes. We chose a spot behind Bell Point, still in close company with others, but at least visually apart from the craziness in Garrison Bay. Nearby, we had a sweet little beach where we could take Nisa. This is where we first inflated our dinghy and mounted the outboard. We learned quickly of nearby Roche Harbor’s nightly tradition of shooting a cannon and lighting fireworks at sundown. A cacophony follows as all boaters within earshot of the cannon blast sound horns to celebrate the end of another great day. After the passage from Oregon and a long a stay in Port Angeles, we felt like the vacation, island-hopping, sailing-for-the-fun-of-it portion of our voyage had really just begun. This is, I think, why our time there remains so memorable. Meals in particular. My first attempt to use the pressure cooker resulted in a fabulous concoction (thus far an anomaly in my shipboard cooking) that we dubbed “Westcott Bay Beans.” (I recorded my recipe for later and, for whatever reason, I have yet to duplicate the meal as I made it that day). I don’t know if it really was that good or if we were just famished, but Michael talked about that meal for days. We slept long and hard that night, our day of slogging having taken its toll. In the morning, I made a very successful coffee cake, only the second baking experiment after Michael’s birthday cupcakes. I couldn’t wait for him to try his French bread recipe. We poked around the boat most of the first day, shook out and sunned our bedding, cleaned up our lines, washed the floors and read about our surroundings. The u-pick Westcott Bay shellfish farm sold mussels at four dollars a pound from a clean-water-flushed tub system that exempted them from the red tide locally in effect (a red tide means shellfish are unsafe for eating). We bought three pounds and I took Nisa for a hike while Michael made dinner. When we reached the shore nearest the boat, we called for a ride. Nisa became very excited when Michael dinghied over to pick us up. She loved motoring around in the small boat. That’s when I took one of my favorite photos. Susanna's Favorite Picture thus far. Dinner awaited. Michael steamed the whole lot of mussels in cooking sherry with sautÃ©ed onions, garlic and bacon, and we ate it all with a few bottles of cheap Belgian beer we’d hung over the side to chill. We wrapped it all up with Milano cookies and tea for dessert as we watched the sun set across the bay. The cannon blasted, more noise followed with a smattering of fireworks as night fell, then total silence. We sat under the stars and crescent moon and agreed it had been the perfect day. We decided that if we ever win the lottery we’d like a little cabin in that bay with a small sailboat moored just off shore. We explored nearby British Camp, breaking to picnic and nap on the former parade grounds, a supremely nappable spot if there ever was one. British Camp, and American Camp on the opposite side of the island, comprise San Juan Island National Historical Park. The camps existed in the mid-19th century when both nations claimed possession of the island. They occupied opposite sides of it more or less peacefully until an American settler shot a British pig in his garden. Great hoopla ensued, both sides beefed up their forces, naval ships arrived, there was big talk of battle and then…nothing happened. The incident became known as the “Pig War,” which some may recall from grade school history lessons. There was no war and the pig was the only casualty, but it all makes for a great story and a lesson in making a whole lot out of nothing really. Several buildings from British Camp remain well preserved, the formal garden has been restored and trails exist to sites of the officers’ quarters and the camp cemetery. Periodically visitors find bits of china, tools or buttons and leave them with the on-site rangers, who display the collection in the barracks building along with other artifacts and a film. All in all, a pretty interesting and very beautiful spot. We moved the boat around the corner to Roche Harbor for the Independence Day festivities. We anchored in the harbor with at least 100 other boats who had the same idea. Such a contrast to Westcott Bay, just a mile away as the crow flies. Roche Harbor is a resort town with a seasonal student staff from all over the world, a marina full of mega-yachts and its own little airstrip. For every airplane that landed behind the resort, 20 seaplanes gracefully glided to rest in front of it amid the chaos of anchored and motoring boats, speeding tenders and paddling kayakers. Such skill must be borne by pilots with at least a smidgen of hunger for danger. I imagine such flying to be exhilarating–just enough hazards to keep a pilot on her toes at all times. These planes land anyplace with enough distance to stop. There were days at anchor when we’d look out to see a plane landing on a narrow swath between boats that only someone from above could possibly see. The Fourth of July had a crazy air about it–part Disneyland, part summer camp, part tailgate party–full of drunken, sunburned parents and their joyful untended kids, all in long lines for beer and/or ice cream, and taking part in the hilarious log-rolling competition and blindfolded dinghy races. So many spectators crowded the floating docks that, at times, whole sections submerged along with the people on them. At some point we learned the resort has a web camera pointed into its garden, refreshing the image on the internet every three minutes. Michael called his dad and over the course of a half hour of shifting this way and that we managed to position ourselves in a spot where Al could see us online. All in all, it was fun to just be in the middle of the chaos, but at the end of the day it made our return to Bluewater perhaps more pleasant than usual. Our own private space. We stayed with Nisa during the fireworks because they tend to scare her so much. So the three of us snuggled under a blanket on the foredeck and watched an awesome display launched from a float not 100 yards from us. We slept in the next day to allow the hangover crowd some time to disperse. When we returned to shore, we wandered through gardens and along trails of a very different Roche Harbor. Quiet, clean and civilized. We laughed at the contrast. Nisa recovered. We took her for a long walk, out past the sculpture garden and the airport to the Mausoleum, a family memorial for the early owners of what used to be a rambling estate. We raced Nisa down the trails and through brush and snapped photos of her leaping full speed over fallen trees. We stayed in Roche Harbor a second night with plans to leave very early with a favorable current. We sailed from anchor, something we strive to do as often as possible, and left in a light breeze. Blue skies and steady winds escorted us all the way to Friday Harbor, on the east side of San Juan Island. Along the way we identified each island we saw and inspected our charts to learn of passable routes for later. Upon reaching Friday Harbor, we opted out of the northern anchorage because we thought 50′ feet of water seemed excessively deep. We laugh about this now. Every day we learn something new, about ourselves or about our boat, or both. I’ve started calling these *Learning Moments. * This day we learned that 50′ of water is only the beginning. The farther we move north, the more dramatic the terrain. These mountains we sail among continue to drop away from us under the water. Some places plunge to 100′ deep or deeper just a few feet from shore. After a bit of driving around, we eventually anchored in 65′ closer to town. Friday Harbor greets visitors and does its very best to keep them. Frequently we suffer from inertia in our travels, and this place nearly sucked us in. It’s a place for perpetual wandering, tasty donuts and great hot showers. I particularly enjoyed the dinghy rides between the boat and the docks. With the large island ferry in port, we snuck under the pilings far below the loading ramp. With the ferry away, we zipped across the gaping slip with its towering pilings. Either way felt like we were doing something incorrigible and oddly romantic. Then we wound our way under, through and around fingers and ramps of the various docks until we reached our destination. In town, a cafe proprietor sold us a bag of UHT (non-refrigerable) creamers, something we covet for our morning coffee but that we have difficulty finding. We bought a new life vest for Nisa. We drank a beer and watched without sound a bit of Wimbledon and a bio of Pete Sampras. We shopped for fresh produce and something to grill for dinner. 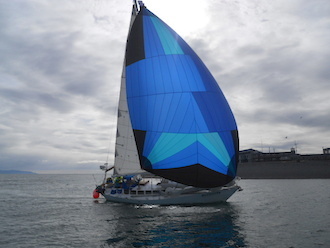 Back aboard for the evening, a neighbor called over to inquire about our solar panel and “the white things on top of the spreaders” (small foam fishing buoys that protect our sails from chafe) and then rowed over to tell us how our boat “has rad lines.” I loved that. Friday Harbor wanted us to stay, so that probably means we’ll return someday.